If you’re attending the Neural Information Processing Systems (NIPS2013) conference this week in Lake Tahoe there is a workshop on Machine Learning for Sustainability with the latest research on applying Machine Learning methods to sustainability problems and how those problems bring challenges of complexity and scalability for the areas of prediction, modeling and control. Bellevue Skyline Photo Credit Michael Walmsley. The Twenty-Seventh AAAI Conference on Artificial Intelligence (AAAI-13) convenes next week in Bellevue, Washington USA. 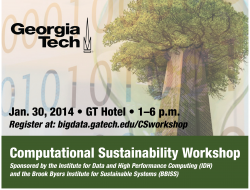 For the third consecutive year there will be a special track on Computational Sustainability, a nascent and growing field of computing that is concerned with the application of computer science principles, methods, and tools to problems of environmental and societal sustainability. This is not a one-way street, however, because sustainability problems force computer scientists into new theory, as well as new practice. 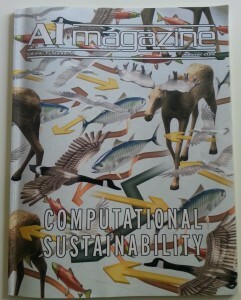 For example, sustainability problems require extraordinary attention to solution robustness (e.g., so that a so-called optimal solution doesn’t catastrophically fail with an environmental change) and issues of uncertainty, ranging from uncertainties in environmental sensor readings to uncertainties in the budget awarded by a state legislative body for wildlife management!The 16 papers of the Computational Sustainability (CompSust) track of AAAI (http://www.aaai.org/Conferences/AAAI/2013/aaai13accepts.php#Sustainability) cover sustainability problems in natural environment, to include various forms of resource management (e.g., species management, wildfire control), and the built environment (e.g., smart grid, building energy usage). The CompSust presentations are arranged in four presentation sessions, all on Thursday, July 18, 2013. These sessions are organized by AI themes of MDPs and sequential processes, optimization and search, data mining, and multi agent systems.As in the past, the Computing Community Consortium (CCC) is graciously supporting best paper awards for the CompSust track, which will be announced at the opening ceremony on Tuesday, July 16. 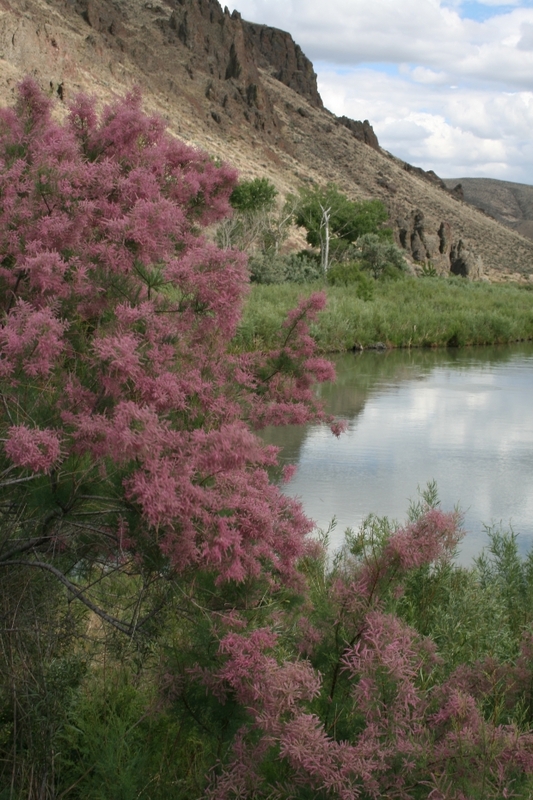 Tamarisk (Tamarix parviflora) also known as Salt Cedar in Lower Owyhee River, OR. Photo: C.C. Shock, Oregon State University. If you have a very large decision making problem and want to find an approximately optimal policy, one of the best ways is often to use simulated trajectories of states, actions and utilities to learn the policy from experience. In many natural resource management problems running simulations is very expensive because of the complex processes involved and because of spatial interactions across a landscape. This means we need an approximate planning algorithm for MDPs that minimizes the number of calls to the simulator. Our paper at AAAI presents an algorithm for doing that. One example of a natural resource management problem with this kind of challenge is management of invasive river plants. For example, Tamarisk is an invasive plant species originating from the Middle East which has invaded over 3 million acres of land in the Western United States. It outcompetes local plants, consumes water and deposits salt into the soil. This pushes out native grass species, fundamentally changes the chemistry soil and alters an ecosystem that many other species rely on (read more : studies of Tamarisk by NASA; how the Tamarisk Collective is removing Tamarisk and restoring riparian ecosystems). Dropped leaves also create a dry layer of fuel that increases the risk of fire in the already fire-prone West. Seeds from plants can spread up or down the river network leading to a huge number of reachable states. There is a choice of treatment actions available in each part of the river: we can eradicate invading plants and/or reintroduce native ones. Each treatment action has a cost, but the more expensive treatments are more effective at supplanting the invading plants. The planning problem is the following: Find the optimal policy for performing treatments spatially across a river network and over time in order to restore the native plant population and stay within a given budget level. This problem can be represented as a Markov Decision Process (MDP) but it very quickly becomes intractable to solve optimally for larger problems. Ideally we want to find a policy with guarantees about how far it is from the optimal solution. PAC-MDP learning methods provide such guarantees by using long simulations to converge on a policy that is guaranteed to be within a given distance of the optimal policy with some probability (see Sidebar: What is an MDP? What does PAC-MDP mean?). Most of the existing PAC-MDP methods look at a sequence of simulated actions and rewards and rely on revisiting states many times over and over to learn how to act optimally in those states. This does not fit the ecosystem management problem. In reality, we begin in a particular starting state S, in which the ecosystem is typically in some undesirable state far from its desired balance. The goal is to find a policy for moving to a world where S does not occur again. It obtains tighter confidence intervals on the quality of a policy by incorporating a bound on the probability of reaching additional (not-yet-visited) states. These tighter intervals mean that fewer simulations are needed. 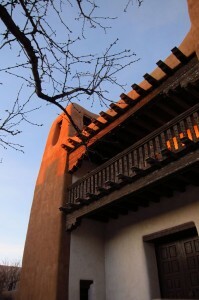 It introduces a more strategic method for choosing which state would be best to sample next by maintaining a discounted occupancy measure on all known states. Our work is based on the idea of being able to restart planning from a fixed start state at any time. This idea was originally put forward by Fiechter in 1994 . However, many important innovations have been made in PAC-MDP community which we apply to our problem. A fundamental feature of many PAC-MDP algorithms is optimism under uncertainty. That is, if there are some states we’ve never encountered or evaluated, then we assume they are high value states. This encourages the algorithm to try to reach unknown states and find out their true value. If such a state does indeed have high value then we benefit directly; if it’s a bad state, then we learn quickly and become less likely to visit the state again. For optimism under uncertainty to work, we need to have an estimate of how likely we are to encounter any particular state over time. One way to do this is with a confidence interval on the probability for reaching a state. The confidence interval can be computed based on how many times we’ve visited that state in previous simulations. The confidence intervals used in previous algorithms are quite loose. Their width typically depends on the square root of the number of states in the the state space. In spatial ecosystem management problems the state space is exponentially large, so this leads to very wide intervals. However, another property of real-world problems can help us. Typically, when we apply an action in a state, the set of possible resulting states is small. This means that only a small fraction of all the states will actually be reached over the planning horizon. So we can use the Good-Turing estimator of missing mass to put an upper bound on the total probability of all the states we have never visited. We integrate this upper bound into the existing confidence bounds and get a tighter one that better represents when to stop exploring. Since the key performance cost that we are trying to minimize is the cost of invoking the simulator, the key is to invoke the simulator on the most interesting state at each time step. The second advance in our paper presents a new way to define “most interesting state” by using an upper bound on the occupancy measure. The occupancy measure of a state is essentially an estimate of how important a state will be given how likely we are to visit it and how far it is from the starting state. More precisely, it is the discounted probability that the optimal policy will occupy the state summed over all time, starting from a fixed starting state. We can compute and update this occupancy measure by dynamic programming during planning. Our key observation is that we can estimate the impact of choosing to explore some state K with action A over another in an efficient way. We compute just the impact locally on the confidence interval for the value K weighted by its occupancy measure. This lets the algorithm focus exploration on the most promising state-action pairs. We ran our algorithm on four different MDPs including a form of the invasive species river network described above and compared the results to the optimal solutions and results from some other algorithms. We found that our approach requires many fewer samples than previous methods to achieve similar performance. The algorithm does this while maintaining standard PAC bounds on optimality. If you want to know more you can read our paper here. To take a look at the invasive species river network problem yourself there is a more detailed problem definition and downloadable code from this year’s RL planning competition which included our problem as one of the test domains. Location and time: Session 31E: MDPs and Sequential Processes (10:35am). Thomas Dietterich, Majid Alkaee Taleghan and Mark Crowley. PAC Optimal Planning for Invasive Species Management : Improved Exploration for Reinforcement Learning from Simulator-Defined MDPs. Proceedings of AAAI-13, Bellevue, Washington, USA. This is one of our series of posts on the latest research in Computational Sustainability being presented at conferences this summer. This time Mark Crowley, a Postdoc in Computer Science at Oregon State University tells us about their new paper at AAAI in Bellevue, Washington, USA this July which has a special track on Computational Sustainability research. Sidebar: What’s an MDP? What does PAC-MDP mean? A Markov Decision Process(MDP)[1,2] is a standard mathematical formulation for decision making problems containing states describing the world, actions that can be taken in each state, rewards that represent the utility obtained for taking an action in a given state and dynamics which define a conditional probability of transitioning from one state to another given a particular action. The solution to an MDP is a policy that tells for each state what action to take in that state in order to optimize the long-term cumulative reward. Given an MDP we can define the value of a policy as the expected reward obtained by following the policy over an infinite planning horizon discounted so that states farther in the future have less impact on the value. There is a wide literature on solving MDPs exactly. The computational cost of these methods scales as the product of the number of actions times the square of the number of states. One community of approximate method that are well studied are the Probably Approximately Correct MDP (PAC-MDP) methods[3,4]. These methods take the idea of PAC estimators from statistics and apply them to estimating the value function of a policy. Essentially, an algorithm for learning a policy is said to be PAC-MDP if we can show that there is at least a probability (1-δ) chance that the value of the policy is within ε of the value of the optimal policy. Further, the algorithm must be efficient: It must halt and return its policy within an amount of time that grows only polynomially in the sizes of the input variables. Bellman, R. 1957. Dynamic Programming. New Jersey: Princeton University Press. Puterman, M. 1994. Markov Decision Processes: Discrete Stochastic Dynamic Programming. Wiley Series in Proba- bility and Mathematical Statistics.Wiley. Fiechter, C.-N. 1994. Efficient Reinforcement Learning. In Proceedings of the Seventh Annual ACM Conference on Computational Learning Theory, 88–97. ACM Press. Strehl, A., and Littman, M. 2008. An Analysis of Model- Based Interval Estimation for Markov Decision Processes. Journal of Computer and System Sciences 74(8):1309–1331. Good, I. J. 1953. The Population Frequencies of Species and the Estimation of Population Parameters. Biometrika 40(3):237–264. 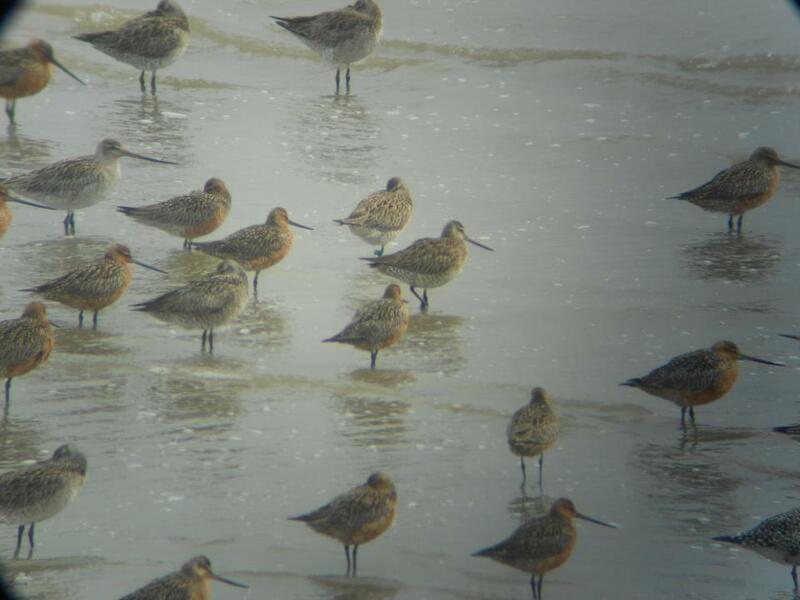 A group of bar-tailed godwits photographed in Songdo, Korea. Photo: Judit Szabo. The earth is facing an extinction crisis, with some estimates claiming that almost half of the world’s existing species may be extinct within the next 100 years. Conservation of biodiversity has never been more important, but the science of conservation is very much in its infancy, with a lot to learn from other fields, including Artificial Intelligence. Biological systems are stochastic, difficult to observe, and subject to external influences that make precise predictive modelling difficult. The traditional response to uncertainty has been to “collect more data” with the goal of eventually designing a management strategy to protect the species once and for all. However more recently this approach has been largely rejected, as delaying effective management action while monitoring is completed can mean a species goes extinct before any action is taken. The current best practice is adaptive management (AM), a process that executes the best management action based on current knowledge, observes how the system responds to the action, and uses this feedback to plan the next action. This integrated process of monitoring and management will be familiar to many in AI as the classic exploration/exploitation trade-off encountered in learning algorithms such as reinforcement learning. Indeed, the cutting edge modelling method for adaptive management problems is to use a method drawn from AI, namely Partially Observable Markov Decision Processes (POMDPs) (for details see below, Sidebar: What’s a POMDP?). 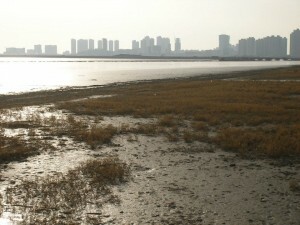 Tidal mudflats in northeastern Asia are critical habitat for the shorebirds of the East Asian-Australasian flyway. Major threats to the birds are coastal development (the new city of Songdo, Korea, can be seen being built in the background of this photo) and sea level rise, which threatens to inundate the mudflats permanently, leaving insufficient habitat for the birds. Photo: Judit Szabo. In our IJCAI paper, we address a limitation of POMDPs that restricts their use in conservation. Biological systems change over time in response to climate change, but current AM methods (including POMDPs) are not able to plan for non-stationary systems. Current methods assume that there is one ‘true’ model of the world, and by collecting enough data, we will eventually converge on the ‘truth’. This is call a stationary model. However, if the world is changing, then collecting more data may never converge to a model. We use a work-around of creating a POMDP that considers a suite of candidate stationary models representing the effects of future change (in our case, sea level rise) on a population, and maintains a belief about the likelihood that a model is the true model at a given time. As the sea level rises, the POMDP planner can ‘switch’ between candidate models once the observations suggest that such a change has occurred. As a case study, we consider the effects of rising sea level on 10 declining migratory bird species that depend upon low-lying mudflats to provide the food they need to complete their migration. 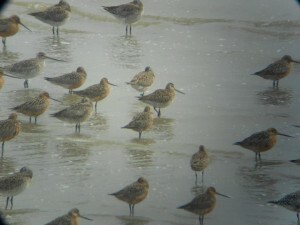 As the sea level rises, these habitats may become inundated so that the birds cannot complete the migration (4) (read more about sea level’s effect on shorebird populations in the East Asian-Australasian flyway here.) We model the AM problem as a POMDP with the workaround described above, and compute when and where action on sea level rise is required to best protect the birds. We present the paper as a data challenge, and offer flyway network data for 10 species of migratory shorebird for the AI community to develop. We present a data challenge as our method only solves relatively small flyway networks and has high runtimes. Because our workaround and the AM approach are actually simplified POMDPs (they are called hmMDPs), there is room for AI researchers to develop custom solvers that exploit the simplifications, allowing us to find conservation strategies for larger and more realistic networks. Want to know more? If you’re going to IJCAI in Beijing in August, come and see our poster and talk to us. Our full paper and the files for the data challenge are also available for download here. Location and time: Planning and Scheduling session (8:30-9:45am). This is one of our series of posts on the latest research in Computational Sustainability being presented at conferences this summer. This time Sam Nicol, a Postdoc at CSIRO Ecosystem Sciences in Australia tells us about their new paper at IJCAI in Beijing this August. For the uninitiated, POMDPs are discrete time stochastic control processes that are used to make decisions in situations where the outcomes are partially controlled by chance and partly by the actions of an agent. In particular, POMDPs have the feature that the managing agent cannot directly observe the true state of the system, and must rely on observations of some other proxy variable to make decisions. The POMDP agent is effectively asking: “what is the best action that I can implement today to achieve my future goal, given that I know that the system is stochastic and the data I’m receiving from observing the system is noisy?” POMDPs appear in a surprising number of places. The most famous real-world example is using POMDPs to assist people with dementia complete simple tasks like hand-washing (2). POMDPs have also been used in conservation, for example for determining how much survey effort should be dedicated to looking for cryptic species like the Sumatran tiger (3).